I love hosting cooking parties. Having a group come over and work together in the kitchen is best way to cook. Whether it is a birthday, anniversary, or a group from work, I can work with you to create a memorable experience. Birthday Parties: Birthday parties are my specialty and make a wonderful gift. We bake the birthday cake and prepare the birthday dinner together. Create an elegant meal, have some wine, and celebrate in a very special way. Birthday Cakes: Going out to dinner. We can make a cake in about 90 minutes. We’ll get it in the oven and enjoy some wine or coffee while it bakes. You can take it with you and have it for dessert at your favorite restaurant. 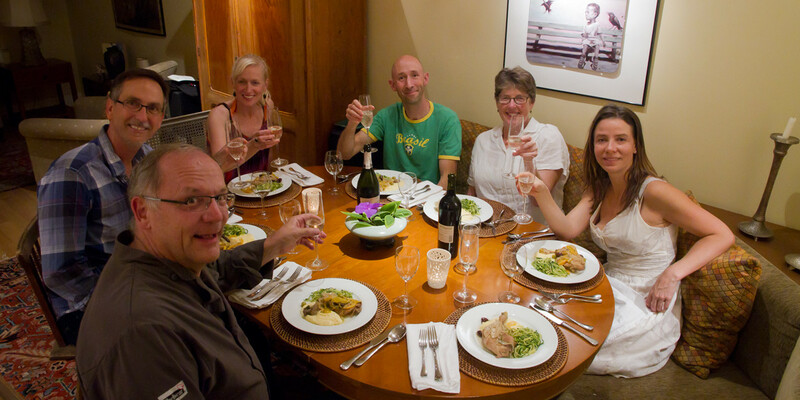 Private Cooking Class: If you have a group of friends who would like to prepare a meal together, give us a call. We can accommodate most any request and help you develop a personal menu for the class. Team Building: Nothing brings a group together more than cooking together and then sitting down to a wonderful meal. We can make it as formal or informal as you want. If you can’t make a regularly scheduled class on the calendar, sign up for my newsletter and let me know what classes you are interested in. If I get at least 4 people, we can settle on a date and make it happen.